The Gurdjieff Legacy Foundation is a receiver-transmitter of the ancient teaching of understanding and conscience rediscovered and reformulated for our time by G.I. Gurdjieff. William Patrick Patterson is a leading exponent and teacher of The Fourth Way. He is in the direct lineage from Mr. Gurdjieff to Lord John Pentland, the remarkable man Gurdjieff appointed to lead the Work in America. The Online Fourth Way School is a new offering of Mr. Gurdjieff's teaching of The Fourth Way. It is dedicated to providing the teaching, special conditions and, when appropriate, individual instructions for each seeker to experience self-awakening. Gurdjieff Videos offers videos on the teaching of The Fourth Way. Also included are videos that relate to the teaching in the context of the present times. The first journal, established in 1992, international and/or domestic, devoted exclusively to G.I. Gurdjieff's teaching of The Fourth Way. 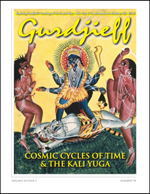 Gurdjieff Books & Videos offers a comprehensive list of books and videos about G.I. Gurdjieff and the teaching of The Fourth Way, including the award-winning documentary trilogy The Life & Significance of George Ivanovitch Gurdjieff. Also included are such authors as P.D. Ouspensky, A.R. Orage, J.G. Bennett, Maurice Nicoll, John Pentland, and William Patrick Patterson. Offers a large selection of used books on diverse esoteric subjects. Selections include books by or on Gurdjieff and The Fourth Way, as well as books on Christianity, Advaita Vedanta, Ancient Egypt, Buddhism, and Western and Eastern spirituality. All listings are rated according to long-established standards using a common set of descriptive terms, based on those set by the Antiquarian Booksellers Association of America, Library of Congress and Independent Online Booksellers Association. The Gurdjieff Legacy Foundation Bay Area, CA offers group work in the practice and principles of G. I. Gurdjieff's teaching of The Fourth Way, under the direction of William Patrick Patterson. The Gurdjieff Legacy Foundation Sacramento, CA offers group work in the practice and principles of G. I. Gurdjieff's teaching of The Fourth Way, under the direction of William Patrick Patterson.